There are many ways to rename a file in Windows. The easiest way is by right-clicking on the file and selecting Rename. You can then type a new name for your file and press enter to finish renaming it. A quicker way to rename a file is by first selecting it by left clicking on it, then pressing the F2 key. This will select the file name so that you can begin typing a new file name, including the file extension. The same thing can be accomplished by first left clicking on the file’s icon, then left clicking once again on the file name to highlight it (this may be a little tricky, if you do this too quickly you will end up double-clicking on the file, which will open it). 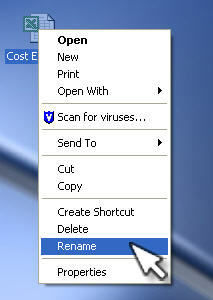 Once the file name is highlighted you can enter a new name and press Enter to rename your file.